Grade level pages are going live this week! 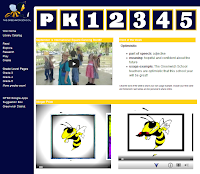 New graphic links have been added to the front page directing students to their grade. Teachers have done an amazing job populating their pages with great information for students! A new section called Stinger Pride has been added to the front page. The hope is to showcase class activities, student projects, and photos of students. A direct link to Genesis has been added to the navigation to facilitate student access to homework and important documents. This week's front page content is looking to the future. A Google Slides presentation is embedded, showing a selection of postcards illustrated in 1899 by French artist Jean-Marc Côté. His work shows what he thought the world would look like in 2000. Students (and staff) are invited to share what they think the world will look like in 2100.